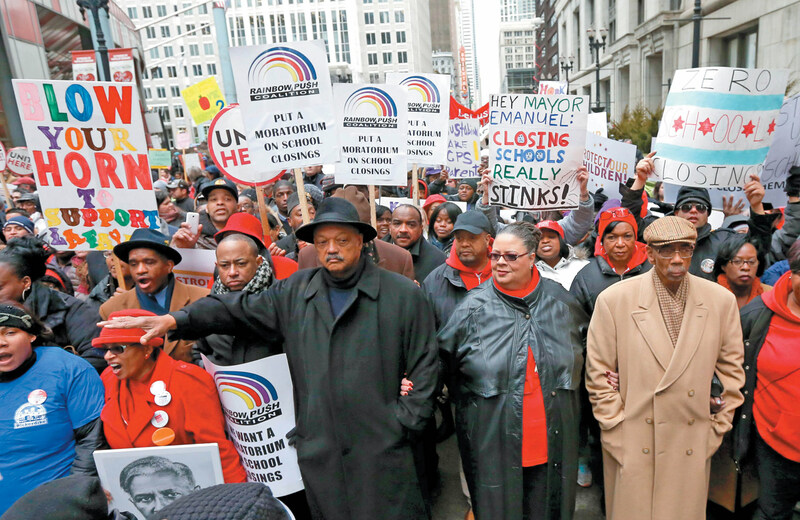 It has long been a central claim of those who call themselves school reformers that they are civil-rights crusaders challenging the status quo—as embodied by intransigent unions and bloated education bureaucracies—on behalf of people of color. The reform playbook has frequently included measures such as “parent trigger” bills that promise to empower parents in low-income minority communities over teachers and administrators at failing schools. Understandably, many parents grappling with inferior schools were initially intrigued by the promise of market reform. Decades of frustration gave way to the hope that “radical reform” might finally produce something better for their children. But evidence of the reformers’ broken promises has quickly accumulated. In the past five years, more and more parents of color have come to realize that school closings do not yield school improvement; that over-testing steals instructional time; and that charter schools do not generally outperform local schools even though they under-enroll students in need of special-education services, extremely poor youth and English-language learners. Shuttering neighborhood schools and dispersing their students, meanwhile, severs the links between communities and local schools, and redistributes real estate, contracts and public funds away from poor communities and into private pockets. Parents and community activists have also come to see that teachers unions are not the obstacle to poor children’s progress depicted in the reform movement’s caricatures. The unions, for their part, have evolved, recognizing that their strained alliances with communities were a source of weakness that antiunion reformers have deftly exploited—and that these links must be repaired if a grassroots movement for educational justice is to have a chance at defeating neoliberal reform. As similar alliances have emerged across the country, giving the movement for educational justice a shot of grassroots momentum, unions have not only changed their rhetoric—moving beyond narrow issues of job security and wages toward broader social-justice concerns—but have actually embraced a new set of goals and demands arising out of their collaborative relationship with communities. Bob Peterson, president of the Milwaukee Teachers Education Association, has cultivated alliances with the local NAACP, immigrant groups and other unions to fight for participatory school redesign rather than closings, as well as fair funding, smaller class sizes, immigrant rights, raising the minimum wage and strategic investment in public schools. In Pennsylvania, the Philadelphia Federation of Teachers and its president, Jerry Jordan, joined with neighborhood parent leaders, allied unions and youth organizers to create the Philadelphia Coalition Advocating for Public Schools (PCAPS), which urges a moratorium on school closings, fair and equitable school funding, charter-school accountability and building a vision for community schools. The elements of a platform were sketched in town-hall meetings in a dozen cities and then refined at an October 2013 conference in Los Angeles, co-sponsored by the AFT, the NEA, the Schott Foundation for Public Education and Communities for Public Education Reform. The alliance committed itself to a set of goals emanating from communities: full funding and support for neighborhood-based schools; quality affordable K–16 education (including for undocumented students); reduction in testing; an end to zero-tolerance policies; and a living wage that lifts people out of poverty. The platform was endorsed by over 150 organizations. The challenges in sustaining this coalition are daunting. Most obviously, corporate reformers enjoy deep pockets and remarkably cooperative media and political allies, who are eager to help them foment schisms between parents, teachers and unions. While attacking bad teachers and public schools as singularly responsible for low student test scores, they downplay the impact of inequality, poverty, racism and a lack of resources on academic outcomes. President Obama, Education Secretary Arne Duncan and many Democrats have played a disturbing role by favoring an initially Republican—but now bipartisan—policy agenda to bring free-market principles to public education. Most recently, Obama administration officials, including Duncan, expressed support for the Vergara court decision, which concluded that teacher tenure violates the rights of low-income children. In contrast to the corporate wealth and political capital that scaffolds the neoliberal reform movement, philanthropic support for community organizing has been declining. Cassie Schwerner of the Schott Foundation describes this as a serious challenge. “Within the coalition, the unions have most of the money. They have been very generous, but community groups need support—they need staff, infrastructure and resources.” For example, Communities for Public Education Reform, a national donor collaborative dedicated to educational-justice organizing, has funneled more than $34 million into the field over eight years—supporting 140 grassroots groups—by partnering with seventy-six donors. Housed at Public Interest Projects, CPER will soon be closing its doors due to a lack of resources. Despite the enormous imbalance in financial resources, the desire for community-controlled public education seems to be winning hearts, minds and elections, as the recent mayoral victories of Bill de Blasio in New York and Ras Baraka in Newark attest. Karen Lewis has just filed papers in a first step to challenge Rahm Emanuel, a proponent and chief architect of corporate education reform, in the Chicago mayor’s race. And there are promising signs of new progressive voices emerging within the national Democratic Party. Donna Brazile, a former campaign manager for Bill Clinton, recently announced the formation of Democrats for Public Education, which will challenge the neoliberal Democrats for Education Reform and contest the claims of the neoliberal reformers. Michelle FineMichelle Fine is a Distinguished Professor of Psychology at City University of New York and the author, with Michael Fabricant, of Charter Schools and the Corporate Makeover of Public Education (Teachers College) and The Changing Politics of Education (Paradigm). Michael FabricantMichael Fabricant is, with Michelle Fine, the author of Charter Schools and the Corporate Makeover of Public Education (Teachers College) and The Changing Politics of Education (Paradigm).